The good news is the tentative ban has been denied by the authorities as well as the local newspaper that ran the original story (which they retracted). Nevertheless, I do believe there was an ‘intention‘ somewhere along the line to enforce this and they may have backed down when the local and international outcry (The Guardian, LA Times, Endgadget etc) took hold. For a country that possesses a Constitution which safeguards civil liberties and freedom of speech, Kuwait sporadically sure likes toying with those liberties such as tentatively banning the Blackberry service, shutting down You Tube, impeding public gatherings and marches, banning and censoring books, literature, films and magazines which are available elsewhere in the Gulf. This week according to media reports, and highlighted extensively in local Weblogs and Twitter, a palpable growing outcry is directed at the tentative plans by The Ministry of Information, Ministry of Social Affairs and Ministry of Finance to outlaw public photography and relegate it to journalism purposes only. This has allegedly resulted in the ban of Digital Single Lens Reflex Cameras (DSLRs) in public places. If this charade is true, then it bodes ill for this country, another regressive move into the annals of ignorance. During the 1980s video cameras and photographic equipment were also shunned by the authorities. I remember visiting Failaka in 1985 and being confronted by a military officer who demanded I hand in my bulky video camera until I left the island. These types of infringements in the name of security were insignificant – we still had an attempt on HH the Amir, explosions at Foreign Embassies in Kuwait and an actual invasion. Why does this country always attempt to stifle home-grown talent? Banning cameras in public places is demoralizing to all the passionate, talented young Kuwait men and women who have excelled in this field and love their hobby, not to mention visitors who attempt to document their travels here. Moreover, banning DSLR cameras is irrational and counterproductive if you think about it; in this day and age of iPhones, Blackberries, 5 MP plus camera phones, Google Earth and the like, anyone can take photograph of anything, quietly, without fanfare, which makes the potential DSLR ban even more preposterous. I have just returned from a trip to Dubai where I witnessed dozens of tourists proudly using their cameras to document Burg Khalifa and the other picturesque locations. No one stopped them, impeded them or asked them what they were doing and you know why, because they respect people’s rights and are intent on making their country more appealing. UAE is able to manage security matters confidently because they have proper security and ID processes in place: eye scanners at airports and entry points, proper electronic government, high fines for breaking the law, a brilliant CCTV system in place in every street corner (not the shoddy black and white choppy, streaming-like quality of the limited equipment we have here) – they truly invest in their infrastructure, maintain it and upgrade it. If Kuwait is serious about its security then it should invest in the same caliber of CCTV and not the bargain basement tenders that usually go towards ineffective systems (i.e. Highway signs with the useless ‘no mobile’ plasma screen) belonging to members of the matching ministry who want a ‘piece of the action’. The sad reality is the government sector here would rather ban something than actually strive to improve it through sheer hard work and effective processes. It’s just easier to ban; a question of laziness and neglect. Needless to say, Kuwait seems unfazed when foreign jets infiltrate our airspace and take aerial shots of our oil refineries and military installations, or when agents and their local conspirators are found to possess blueprints and photographs of said installations, but no, lets go after the ‘little guy’, the amateur photographer or tourist on the street taking pictures. It’s a hypocritical, spineless action by the authorities. Moreover, I suspect the issue is not just relegated to security, a myriad of reasons could have led to the support of this ban, fundamentalists who felt cameras and pictures are a ‘Tool of the Devil,’ government officials and ministries disgraced at seeing shots of Kuwait’s dilapidated infrastructure, environment and mismanagement on weblogs, internet forums and magazines. 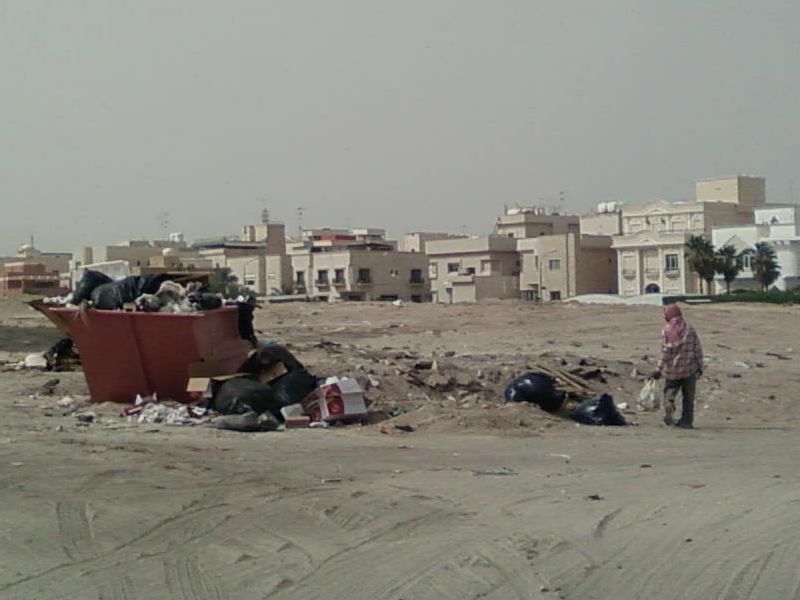 You cannot conceal the squalid side of Kuwait; it is there for everyone to see. Furthermore, this law against public photography will not be enforced, just as seatbelt, no mobile while driving, no litter, no smoking areas, and other ‘laws’ cannot be enforced in this Land of Confusion. When will The Ministry of Public Works realize it’s not the amount of contracts signed nor the amounts involved, it’s how projects are designed and executed. Update 28/4/10 : We have received the following message from Ms. Nadia, a close friend of the victim. “Hilaliya thank you so much for posting this! Dana is 22 years old NOT 20. Her mom passed away from a STROKE (not heart attack) due to the stress of her daughter being treated this way. Dana was on Jawazat round about when this traffic officer in a pick up truck with tinted windows cut her off and made her slam on her brakes. He got out and WAS wearing the police uniform, however he was off duty (and NOT in a police car). He took her license and told her to follow him to the RUMATHIYA police station EVEN though they were right infront of the SALMIYA police station. On the way he was speeding and not even indicating. When she arrived to the police station she waited in her car while he went inside. Soon he came back with a man in a dishdasha and told her to go inside. She said no as she was the only girl alone and there were men inside, and she wanted her parents to arrive first. (Dana was speaking in English as her Arabic is poor). The disgusting officer started screaming at her at the top of his lungs saying that he’d KILL HER, put her face under his shoe and squash it, and punch her face that her glasses will go in her eyes and start bleeding to death! The story gets even worse, however its best told by DANA herself. Dana and her family are respectful people that obey the laws of KUWAIT as well as the religion. They are good people, and they DO NOT deserve this. Her friends and family will not rest until JUSTICE IS SERVED. Dana and her father have been interview by AL WATAN TV, and the show will be aired onTHURSDAY 29TH APRIL @ 10pm. (‘The Khaled Adul Jaleel Show’). May her mother REST IN PEACE. I am not going to touch on Taxi drivers (working for companies owned by Interior Ministry personnel) selling female passengers into slavery and prostitution. I am not going to touch on Human Traffickers: certain Merchants and Companies, MPs, Municipality Members, Sheiks and others being untouchable. I am not going to touch on certain ‘Security Apparatus’ members, bribed by dangerous foreign elements attempting to infiltrate Kuwait. I am not going to touch on your ministry’s plans to alleviate traffic, reduce congestion and car accidents. I am not going to touch on the increasing crime rate in Kuwait. I am sure you and your ‘team’ tirelessly work night and day to formulate solutions to the above issues. However, I do have but one simple question. 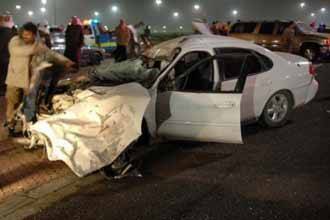 Kuwait has one of the highest accident rates in the world, and it is only getting worse. 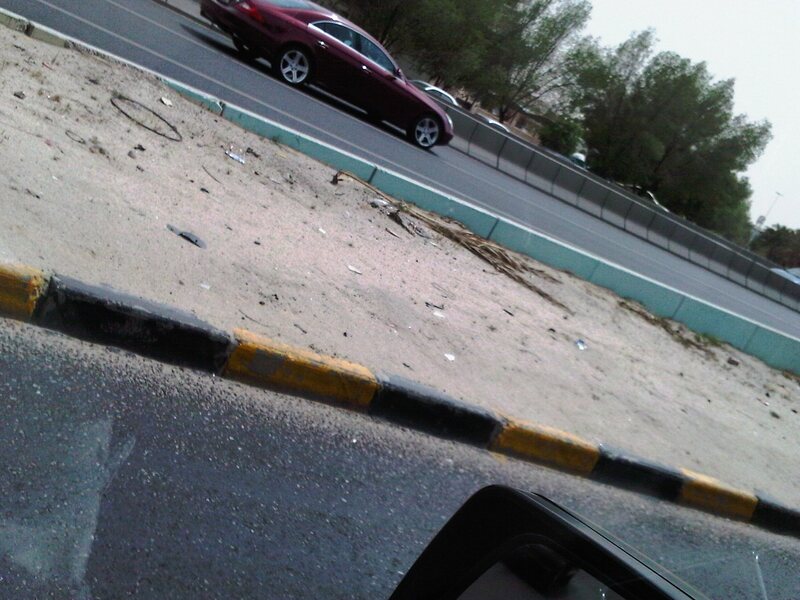 The recent tragic accident on a Doha, Kuwait highway resulting in the death of five individuals with fourteen injured (the victims included onlookers and racers on the popular highway strip) only goes to show that being on the road has turned into a hazard for all citizens. When is this country – an affluent country – going to build a racetrack a la Bahrain or Abu Dhabi so kids can go race and save themselves and us further tragedies. It is time for Kuwait to build a track, whether its government or private funded is irrelevant; young men will never change, they speed, they show off, they do stupid car tricks – at least at the race track they can race, blow of steam and improve their driving and be monitored. 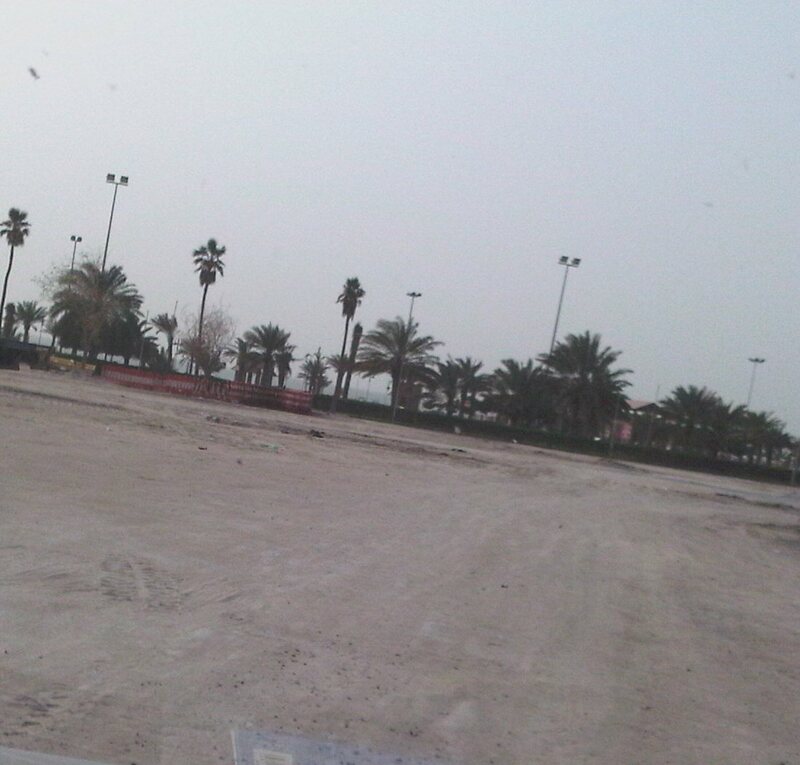 From what I have been relayed, Basil Salem Al-Sabah tried for years to push for a race track but was shunned – this was followed by offers from private citizens willing to invest in a race track but the government refused them land and permission. This is a serious safety issue and the government needs to move on this as ASAP. The workshop will provide local bloggers and members of the public interested in on-line media and citizen journalism with the opportunity to learn more about issues affecting freedom of expression and the internet in Kuwait. The Growth of Blogging in Kuwait. The Effect of Blogging on Public Debate and the Traditional media. How to Create and Maintain a Successful Blog. Legal Concerns and Restrictions on Bloggers. The panel will be moderated by veteran blogger and occasional Hilaliya Guest Writer Mohamed Al-Yousifi (http://www.ma6goog.com/). As the state wrangles over Iraqi UN compensation payments, rising corruption, unemployment, visa trafficking, electricity and water dilemmas, and a myriad of other usual problems, let us look back at August 2nd, the Iraqi occupation of Kuwait (that’s right Mr. Kuwait Government, the Iraqi invasion and occupation, not the ‘Baathist‘ invasion, not the ‘Saddamist’ occupation – you can’t rewrite history). There is nothing to say really. It’s all been said elsewhere and it’s all been said in the following article ‘A Soldier’s Diary: A Kuwaiti Volunteer Looks Back at ‘Liberation’ – you’ll know what we went through and how we feel about Kuwait in its current incarnation. 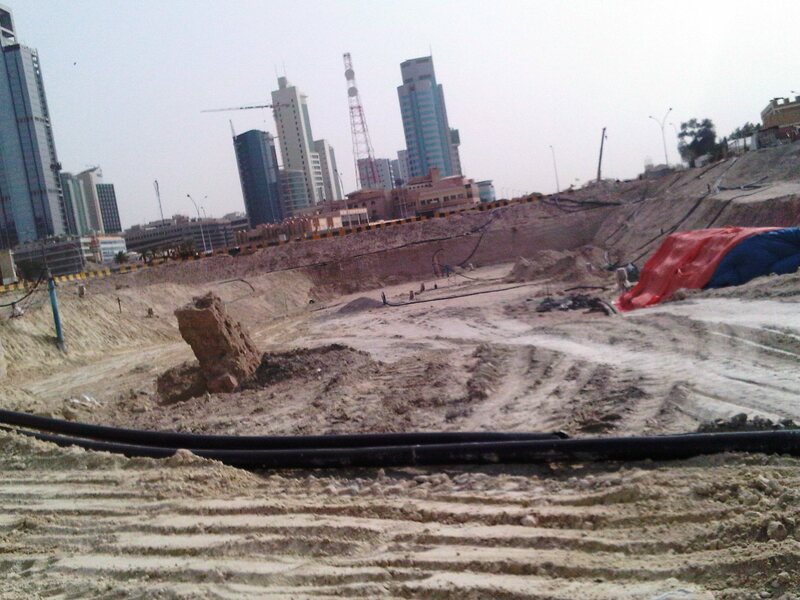 Where Is The ‘Green’ In Kuwait? 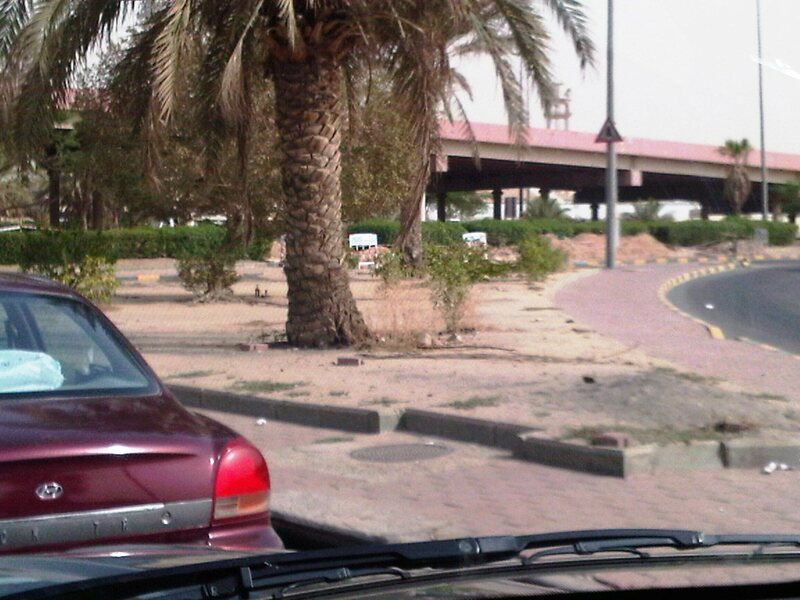 Kuwait, large, empty patches and plots of desert land around homes, bridges, buildings – many in central Kuwait and inside neighborhoods – why can’t they beautify or ‘green’ the areas: palm trees, grass, parks – anything? Kuwait should plant millions of palm trees like the UAE at least – if any city needs additional oxygen it’s hot, dusty Kuwait.